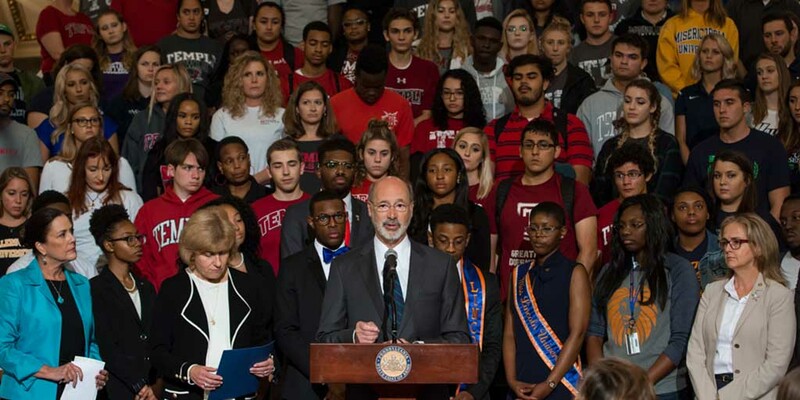 Harrisburg, PA – Governor Tom Wolf joined legislators, advocates, and students today to announce the upcoming introduction of a package of six bills as part of his “It’s On Us PA” campaign to combat sexual violence in K-12 schools and on college and university campuses. “It’s On Us PA” launched last year as the first statewide campaign to address sexual assault in schools and on college campuses and builds on the national “It’s On Us” movement. Thousands of Pennsylvanians, including superintendents and university and college presidents signed the “It’s On Us” Pledge, which encourages everyone to help end sexual assault. Since the campaign began in January 2016, the Governor and members of his administration have engaged hundreds of students, educators, administrators, advocates, healthcare personnel, researchers, campus safety and law enforcement officials, and policymakers to identify opportunities for improving systems to address and prevent sexual violence in schools and on campuses in Pennsylvania. This legislative package is the result of those conversations. Cosponsorship memos for these bills have been circulated in the House and the Senate, and Governor Wolf encourages members in both chambers to sign on and support these important measures. In addition to these legislative initiatives, the governor secured $1 million in the 2016-17 and 2017-18 budgets for evidence-based prevention, reporting, and response systems to address campus sexual assault. This past year, 36 postsecondary institutions across Pennsylvania were awarded grants, reaching more than 87,000 students and 16,000 professional staff through awareness and training programs, improved reporting systems, and other critical supports for survivors and campus community members.